Heat the oven to 350 degrees F. Lightly grease a 13x9x2-inch baking dish. Stir the chicken, soup, sour cream, tomatoes and green chiles, beans and seasoning mix in a large bowl. 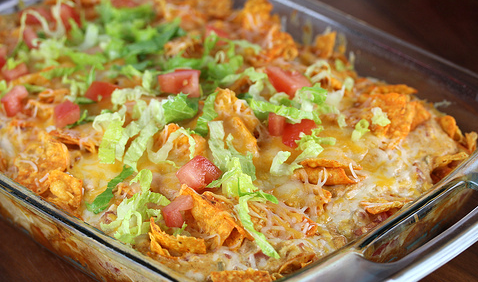 Layer half the chicken mixture, 3 cups tortilla chips and half the cheese in the baking dish. Layer with the remaining chicken mixture and tortilla chips. Cover the baking dish. Bake for 30 minutes. Uncover the baking dish. Sprinkle with the remaining cheese. Bake, uncovered, for 10 minutes or until hot and bubbling and the cheese is melted. Sprinkle with the chopped tomato, green onion and cilantro before serving, if desired. No comments for: "Chicken Taco Casserole Recipe"